When the SPH10 is not working properly or is in faulty status for any reason, you may reset by pushing the pin-hole reset button at the back of the headset main unit. Insert a paper clip into the reset pin-hole and press the reset button for a second with light pressure. The SPH10 will be switched off, and you have to turn the system back on and try again. However, this will not restore the headset to factory default settings. You can easily adjust the volume by rotating the Jog Dial. You will hear a beep when the volume reaches maximum or minimum level. The volume is set and maintained independently at different levels for each audio source even when you turn off and on the headset. For example, once you set the volume for mobile phone handsfree, it will not change even if you adjust the volume when you hear Bluetooth MP3 music. So you can always maintain the preferred optimum volume level for each audio source. Two microphones are included in the package: a long-boom microphone for high noise environment and a short microphone for indoor use. Plug the microphone into the microphone port to fit triangle marks as described in the below picture. Adjust the direction of the long-boom microphone so that the “II” mark on the microphone is pointing towards your mouth. Since SPH10 is mostly exposed on external environment where noise prevails, microphone can be selected according to the noise level. For the highly noisy environment, boom-microphone is recommended allowing microphone to stay near user’s mouth. For the less-noisy environment, mini microphone is recommended allowing users to move freely. 1. Turn on the SPH10 and press the Phone Button for 5 seconds until the LED flashes red and blue alternately and you hear multiple beeps. You will hear a voice prompt saying “Phone pairing”. 2. Search for Bluetooth devices on your mobile phone. Select the Sena SPH10 in the list of the devices detected on the mobile phone. 4. The mobile phone confirms that pairing has completed and the SPH10 is ready to use. You will hear a voice prompt from the SPH10 saying “Your headset is paired”. 5. If the pairing process is not completed within three minutes, the SPH10 will return to stand-by mode. 1. Turn on the headset and press the Phone Button for 5 seconds until the LED flashes red and blue alternately and you hear multiple beeps. 2. Within 2 seconds, tap the Jog Dial again, then the LED turns to red flashing and the beeps turn to double mid-tone beeps. You will hear a voice prompt saying “Media selective pairing”. 3. Search for Bluetooth devices on your smartphone. Select the Sena SPH10 in the list of devices detected on your phone. 4. Enter 0000 for the PIN. Some smartphones may not ask for PIN. 2. Within 2 seconds, tap the Phone Button again, then the LED turns to blue flashing and the beeps turn to multiple mid-tone beeps. You will hear a voice prompt saying “Phone selective pairing”. 4. Enter 0000 for the PIN. Some smart phones may not ask for PIN. 1. To pair the second mobile phone, press the Jog Dial for 5 seconds again until the red LED is rapidly flashing and you hear multiple beeps. 3. Search for Bluetooth devices on your mobile phone. Select the Sena SPH10 in the list of the devices detected on the mobile phone. 5. The mobile phone confirms that pairing has completed and the SPH10 is ready to use. You will hear a voice prompt from the SPH10 saying “Your headset is paired”. 2. You can also answer the incoming call by loudly speaking any word of your choice if Voice Activated Phone Answering is enabled. - Enter numbers on your mobile phone keypad and make a call. Then the call is automatically transferred to the headset. - For some older mobile phones which do not automatically transfer calls to the headset, press the Phone Button after entering phone numbers on the mobile phone keypad. - Tap the Phone Button in stand-by mode to activate the voice dialing of your mobile phone. For this, the voice dialing feature must be available on the mobile phone. Refer to your mobile phone manual for further instruction. If this feature is enabled, you can answer incoming calls by simply saying a word loudly enough. For example, when you hear a series of beeps for an incoming call, you can answer the phone by saying “Hello” or any other word loudly. This is enabled from the factory but you can disable this. If this mode is disabled, you have to tap the Jog Dial or the Phone Button to answer an incoming call. 1. To enter into the voice speed dial menu, double tap the Phone Button and you will hear a mid-tone single beep and a voice prompt saying “Speed dial”. 2. Rotate the Jog Dial clockwise or counter-clockwise to navigate between the menus. You will hear voice prompts for each menu item. 4. After selecting the last number redial menu, you will hear a voice prompt saying “Last number redial”. Then, to redial the last phone call number, tap the Phone Button or the Jog Dial. 5. To call one of the speed dials, rotate the Jog Dial clockwise or counter-clockwise to navigate between the menus until you hear a voice prompt saying “Speed dial (#)”. Then, tap the Phone Button or the Jog Dial. 6. If you want to exit the speed dial immediately, rotate the Jog Dial until you hear a voice prompt saying “Cancel”, and tap the Phone Button or the Jog Dial. If any button is not pressed within 15 seconds, the SPH10 will exit the voice speed dial menu and goes back to stand-by mode. Make sure that you connect the mobile phone and the headset in order to use the speed dial function. The Bluetooth audio device must be paired with the SPH10 by following the “Bluetooth Stereo Device Pairing” procedures described in the 6.2 chapter. The SPH10 supports the Audio/Video Remote ControlProfile (AVRCP), so if your Bluetooth audio device also supports the AVRCP, you can use the SPH10 to remotely control music playback. You not only can adjust the volume but also use the functions such as play, pause, next track and previous track. Plug your stereo MP3 player directly to the SPH10 by using the enclosed stereo audio jack cable. To adjust the volume, rotate the Jog Dial on the headset. You may adjust the volume on the MP3 player also. The SPH10 can be paired with up to three other headsets for Bluetooth intercom conversation. 1. 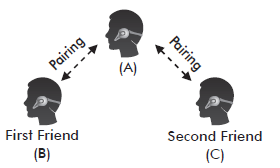 Turn on the two SPH10 headsets (A and B) that you would like to pair with each other. 3. 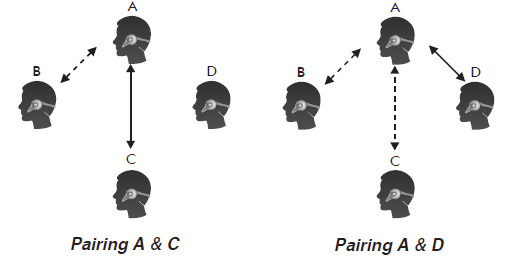 Simply tap the Jog Dial of any one of the two headsets A or B (It doesn’t matter that you choose A or B.) and wait until the LEDs of both headsets turn to blue and intercom connection is automatically established. 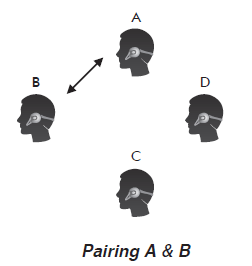 The two SPH10 headsets A and B are paired with each other for intercom conversation. If the pairing process is not completed within one minute, the SPH10 will return to stand-by mode. 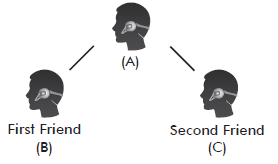 You (A) can have a three-way conference intercom with two other SPH10 friends (B & C) by establishing two intercom connections at the same time. While a three-way conference intercom is in progress, mobile phone connection of all three participants would be temporarily disconnected, but as soon as the conference intercom terminates or one of the participants leaves the intercom, all mobile phones would be automatically reconnected. During the conference intercom, if you have an incoming mobile phone call, terminate the conference intercom to automatically reconnect the mobile phone and receive the call. 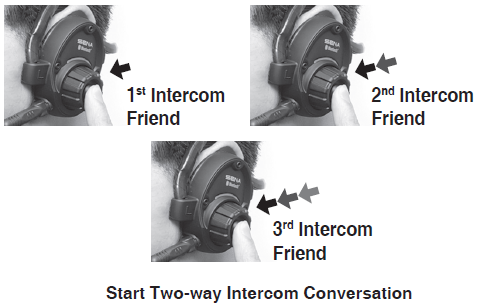 you (A) may start an intercom conversation with the intercom friend (B). Or intercom friend (B) may start an intercom call with you (A). 4. Now you (A) and two SPH10 intercom friends (B & C) are having a three-way conference intercom. You can have four-way conference intercom with three other SPH10 users by adding one more intercom participant to the three-way intercom. 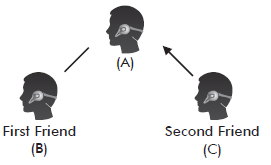 While you are having three-way intercom, a new participant (D), who is an intercom friend of your intercom friend (C), may join the conference intercom by making an intercom call to your intercom friend (C). 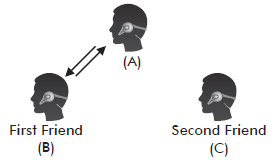 Please note that in this case, the new participant (D) is an intercom friend of (C), not of you (A). If this feature is enabled, you can initiate an intercom conversation with the last connected intercom friend by speaking any word loudly enough. The most effortless way to trigger intercom VOX is to blow into the microphone as if blowing dust off the microphone. If you start an intercom conversation by VOX, the intercom terminates automatically when you and your intercom friend remain silent for 20 seconds. However, if you manually start an intercom conversation by tapping the Jog Dial, you have to terminate the intercom conversation manually. However, even when this feature is enabled, if you terminate intercom conversation manually with the Jog Dial, you are not able to start intercom by voice temporarily. In this case, you have to tap the Jog Dial to restart the intercom. This is to prevent repeated unintentional intercom connections by strong wind noise. If you tap the Jog Dial to start an intercom conversation, it is not terminated by 20 seconds of silence. After turning SPH10 off and on, you can start intercom by voice again. You can enable this feature in the configuration menu. You may make a four-way Universal Intercom connection with a couple of different configurations, 1) three SPH10s and one non-Sena Bluetooth headset or 2) two SPH10s and two non-Sena Bluetooth headsets. 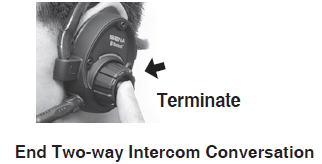 You may have a couple of other four-way Universal Intercom configurations, 1) your headset (A), a non- Sena Bluetooth headset (B), another SPH10 (C), and a non-Sena Bluetooth headset (D), 2) your headset (A), a non-Sena Bluetooth headset (B), and two other SPH10 headsets (C and D). You may make the four-way Universal Intercom call the same way as a normal fourway intercom call. 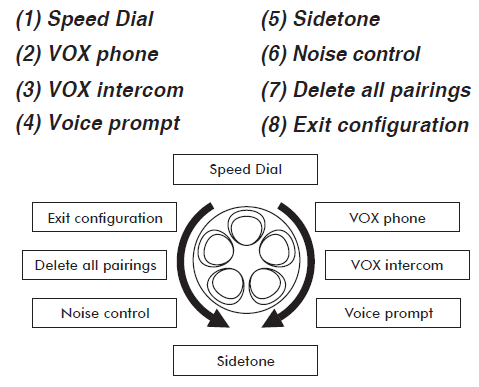 made, all headsets connected cannot use the mobile phone call function since the connection between the headset and the phone is disconnected temporarily. If you disconnect the intercom call, the mobile phone connection is made again automatically so that you can use a mobile phone call function. During the intercom call, you cannot pick up the incoming phone call since it is disconnected, however, you can pick it up if you disconnect the intercom call. 1. 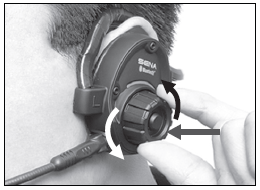 You (A) need to be paired with non-Sena Bluetooth headset (B) and another SPH10 headset (C) for the three-way conference intercom. 3. The Other SPH10 (C) may join the intercom by making an intercom call to you (A). 4. Now you (A), non-Sena Bluetooth headset (B), and the other SPH10 (C) are having a three-way conference intercom. 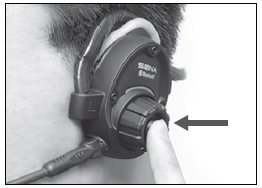 The SPH10 can be paired with non-Sena Bluetooth headsets for Bluetooth intercom conversation. You can pair the SPH10 with only one non-Sena Bluetooth headset; if you pair with a different non-Sena Bluetooth headset, the previous pairing list will be removed. 1. Turn on the SPH10 and a non-Sena Bluetooth headset which you want to pair with. 2. Press and hold the Jog Dial on the SPH10 for 8 seconds until the blue LED flashes rapidly. You will hear a voice prompt saying “Universal intercom pairing”. 3. 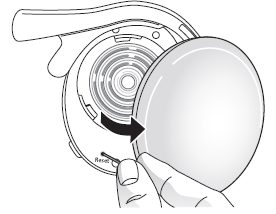 Perform the operation required for handsfree pairing on the non-Sena Bluetooth headset (refer to the users’ manual of the headsets you want to use). The SPH10 will automatically perform pairing with non-Sena Bluetooth headsets in pairing mode. a. To answer the phone call and stop the intercom conversation, tap the Jog Dial or the Phone Button. When you hang up the phone call, the intercom will automatically be recovered. until you hear a beep. Unlike other motorcycle Bluetooth headsets, this prevents a user from being dropped out of an intercom conversation by an incoming mobile call. 2. When you have an incoming intercom call during a mobile phone call, you will hear 4 high tone beeps, alerting you that there is an incoming intercom call. You will also hear a voice prompt saying “Intercom requested”. In this case, the intercom call does not override the mobile phone call because intercom has lower priority than mobile call. You have to hang up the mobile phone call to make or receive an intercom call. what you are speaking during an intercom conversation or a phone call. To enable/disable this feature go to the configuration menu. 1. To restore the SPH10 to factory default settings, press and hold the Phone Button for 12 seconds until the LED shows solid red and you hear double beeps. You will hear a voice prompt saying “Factory reset”. returns to stand-by mode. You will hear a voice prompt saying saying “Canceled”. To disable this feature go to the configuration menu. You can set the configuration of the SPH10 by the voice menu instruction as below. 2. Rotate the Jog Dial clockwise or counter-clockwise to navigate between the menus. You will hear voice prompts for each menu items as below. 4. If any button is not pressed within 10 seconds, the SPH10 will exit the configuration and goes back to stand-by. Go to the configuration menu. To delete all Bluetooth pairing information of the SPH10, rotate the Jog Dial until you hear a voice prompt saying “Delete all pairings”, and tap the Phone Button to confirm. Tapping the Jog Dial is not available for this setting. The LED turns on red while charging, and turns to blue when the headset is fully charged. It takes about 2.5 hours to be completely charged. The SPH10 supports firmware upgrade function. Please visit Sena Bluetooth web site at www.sena.com to check the latest software downloads.